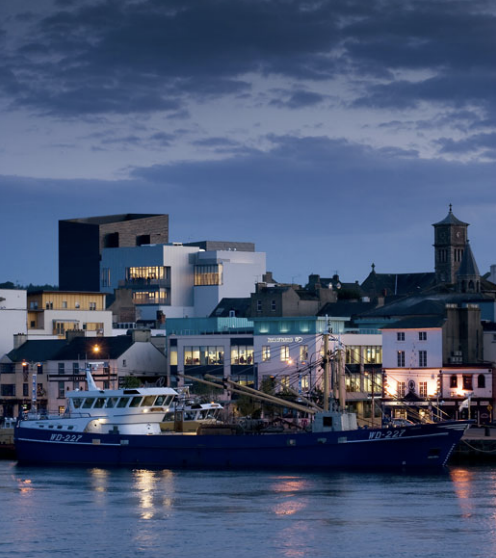 The home of the internationally renowned Wexford Festival Opera designed by Keith Williams Architects with the Office of Public Works (OPW), has been officially recognised by the Irish Government’s Department of the Arts, Heritage and the Gaeltacht as Ireland’s National Opera House . Minister Heather Humphreys made the historic announcement at the official opening of the 63rd Wexford Festival Opera. The Minister for the Arts, Heritage and the Gaeltacht Heather Humphreys announced the renaming of the internationally award-winning Wexford Opera House as Ireland’s National Opera House in front of an estimated 18,000 people who lined the quay-front of Wexford at the official opening of the 63rd Wexford Festival Opera. Before attending the Festival’s gala premiere performance as the guest of honour, Minister Humphreys took centre stage in the now officially recognised National Opera House and addressed the opening night capacity audience to confirm this major development, saying, “I am honoured to have been asked to open the Wexford Festival Opera, the centerpiece of Wexford’s cultural calendar. And I am delighted to be able to give my full support tonight to the renaming of Wexford Opera House as The National Opera House. I have asked my officials to work with Wexford and the Arts Council to put this into effect, in recognition of Wexford’s position as the home of Ireland’s only custom built Opera House.